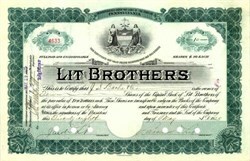 Beautifully engraved certificate from the Lit Brothers issued no later than 1926. This historic document was printed by the Security Banknote Company and has an ornate border around it with a vignette of a shield between allegorical women. This item is hand signed by the Company’s President ( Samuel Lit ) and Treasurer ( Jacob Lit ) and is over 93 years old. 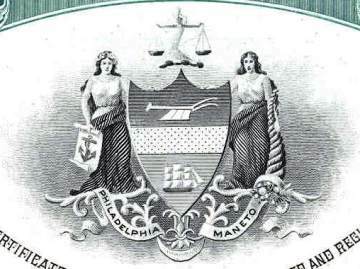 Samuel and Jacob Lit open Lit Brothers department store at Eight and Market Streets in 1893.